When you are ready to begin your design concept, there is no better place to start than at Commercial Surfaces™ showroom. Here you will find thousands of samples of all our commercial products available to view in one location. Our samples and pricing are always current and up to date, and we have the space you need to mock up your design and see room settings in person. You can even bring in your clients to discuss your options. Then you can carry your samples right out the door with you. You will receive personal assistance from an experienced flooring consultant who is familiar with the hottest styles available as well as the best applications of each product option. 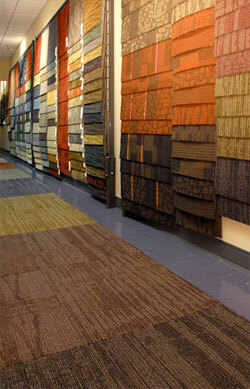 We will even pre-select samples ahead of time if you let us know what you are looking for.